Besides great jazz music, yummy beignets (donut-like treats) and a great architectural bike tour of the Lower Ninth Ward, there is now a new reason to visit New Orleans, Louisiana (NOLA). At 2828 Thalia Street, you will find “the Imagination Playground – an architect-designed kit of life-sized building blocks as well as a wide array of other construction toys, games, and books.” Here in a Central City abandoned lot, a group of people have started a new program where kids interact with architecture and design – to make use of a vacant lot which improves the neighborhood, and as a double delicious treat, they are also teaching kids about architecture and design. Maybe some of those kids will learn about construction and design that would otherwise have eluded them – maybe a future builder will be born! 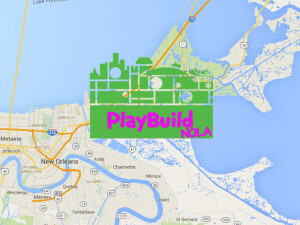 The team that supports this project is called Playbuild NOLA, a group comprised of community members, a construction company and some non-profit support. See the whole story here of how they got started. The group designed some large building toys for kids to use at the new playground and they acquired a 30×90 foot residential lot at the corner of Thalia and Willow Streets. On April 7, 2015 the architecture playground launched. Congratulations and what a great idea! We bet that if you had a secret camera and could watch the playground, the adults are having as much fun as the kids. It usually works that way.